By: JoAnne Fischesser, DHS Volunteer and Member. With a good “search engine”- Ancestry, Family Search, Google, etc. NOTE: This is not a complete list of possible side effects. If you notice other side effects not listed above contact your local genealogist. I began my journey into genealogy shortly after I retired in 2010. Having celebrated many family events and living near my mother's side of the family, I felt confident in my knowledge of my maternal heritage. On the other hand, I knew little about my father's side (Fischesser) so that became the focus of my research. What I knew: My grandfather, Theodore (born in Cincinnati), married Luella Strassell (born in Cincinnati). They had 9 children, including my father, Alvin. Some of my aunts and uncles I had met, others were known only by name. I knew my great-grandfather, Sosthenes (from “Germany”) married Frances Brune (born in Cincinnati). Growing up I had heard of a few great-uncles and great- aunts and cousins. Alvin and Mary Fischesser. 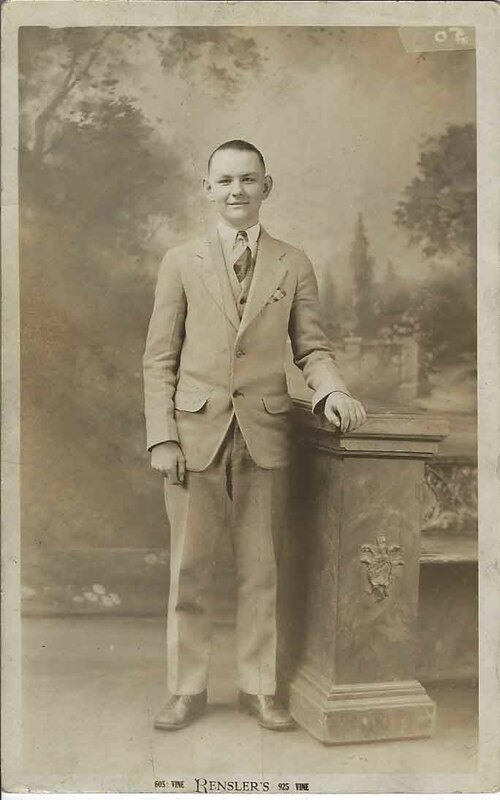 Alvin, was a meat cutter and part owner of Macke’s I.G.A. store on Glenway Ave near Ferguson Rd. I joined www.ancestry.com, researched on www.familysearch.org,www.findagrave.com. and other websites. I went to Our Lady of Victory Cemetery where I knew my great-grandparents, grandparents and two uncles were buried. With the help of the staff at OLV, I discovered the unmarked graves of 4 children, presumed to be the children of Sosthenes and Frances. Visiting the Delhi Historical Society and with the help of Peg Schmidt, I found additional information and pictures of my family. JoAnne's family tree. It contains over 900 names and it is 3ft. wide and 18ft. long. I began constructing a family tree. I have over 900 names and have done only half of Sosthenes's and Frances's twelve children. It is 3ft. wide and 18ft. long! Fischesser Blacksmith Shop formerly located on the corner of Cleves Warsaw and Neeb road, the current site of the Western Hills Country Club. The CJ Fischesser store was in Hyde Park, on the corner of Astoria and Shady Lane. I attended family reunions to gather and share more information. I joined the Green Township Genealogy Club (meets at the Green Twp. library every 3rd Thursday. All are welcome). I belong to both the Green Township Historical Society and the Delhi Historical Society (where I volunteer one afternoon a week). I'm a member of the Ohio Genealogy Society and have attended their conventions. I found and contacted a Fischesser currently living in Ruehlisheim, France (hometown to my great-grandfather, Sosthenes). This resulted in a visit there last June by my niece and her family. I hope to make the trip myself someday. So, as you can see, I'm addicted to genealogy. But it's not an addiction I want to recover from anytime soon. I'm having way too much fun!